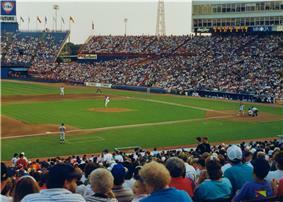 The Tigers playing against the Texas Rangers during a 1992 away game at Arlington Stadium. The Detroit Tigers' 1992 season was a season in American baseball. It involved the Detroit Tigers attempting to win the American League East. December 20, 1991: Dan Gladden was signed as a free agent by the Tigers. Before 1992 Season: Steve Carter was signed as a Free Agent with the Detroit Tigers. Cecil Fielder was left off the All Star team despite leading the league in RBIs at the midway point. At season's end, Fielder wound up third to Juan González and Mark McGwire in the American League home run chase. His 124 RBIs made him the first American Leaguer since Babe Ruth to lead the majors in runs batted in for three consecutive seasons. On September 25, Sparky Anderson tied Hughie Jennings as the Tigers all-time winningest manager (1,131 wins). He would become the team's winningest manager two days later, with a 13-3 victory over the Cleveland Indians. June 1, 1992: Frank Catalanotto was drafted by the Tigers in the 10th round of the 1992 Major League Baseball Draft. Player signed June 2, 1992. ^ "April 6, 1992 Toronto Blue Jays at Detroit Tigers". Baseball Reference.com.